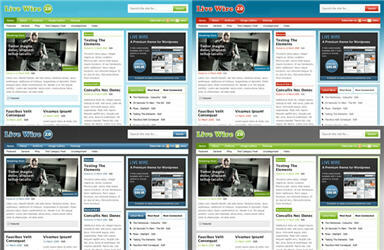 Live Wire 2.0 is the third of three theme belonging to the Live Wire Premium WordPress series. This one is quite different as far as the color scheme goes compared to the Live Wire Style and Live Wire Edition themes. The main different is the Live Wire 2.0 theme has actual background colors like aqua blue, black, charcoal gray, and ocean blue. To me these background colors really add some additional flare compared to the plain white color the other two themes use. Regardless of which color or theme in this series you choose, you’ll be getting top quality work and template code. These themes can of course be used for any sort of blog or website so if really want to make your site stand out from the rest, I highly recommend purchasing one of these themes. I promise, you won’t be disappointed. I really love all the designs that Adii has done. His work is high quality craftsmanship and underlying code will provide you with a solid design base and a ton of exceptional features. It’s also setup to run several different banner ads so you can make additional money from private ad sponsorships.If you’re looking to spend a little money to buy a great WordPress theme then this is a great one to buy. Gotta love all the features and layout for less than $100. Single-Use License ($99.95) – This package is for the person who intends on using this theme on a single website. Included in this package, is the full theme with all of its features and modules. The credit link is not required to stay in tact. Live Wire Package ($149.95) – This package contains all three of the above themes and allows you to use the Live Wire Theme on 2 websites (domains) concurrently. The credit link is not required to stay in tact. Developer’s License ($249.95) – This package is for the person who intends on using this theme on multiple websites. Included in this package, is the full theme with all of its features and modules. Also included in this theme is the fully layered Photoshop file to assist you when customizing the theme. The credit link is not required to stay in tact. The Live Wire themes are trend setters so you can be assured of only the best when you purchase this theme!